I shredded Berlin wools of green, purple, and red to create the olive body color. The purple blended with the green has a profound effect, turning the blend to olive. 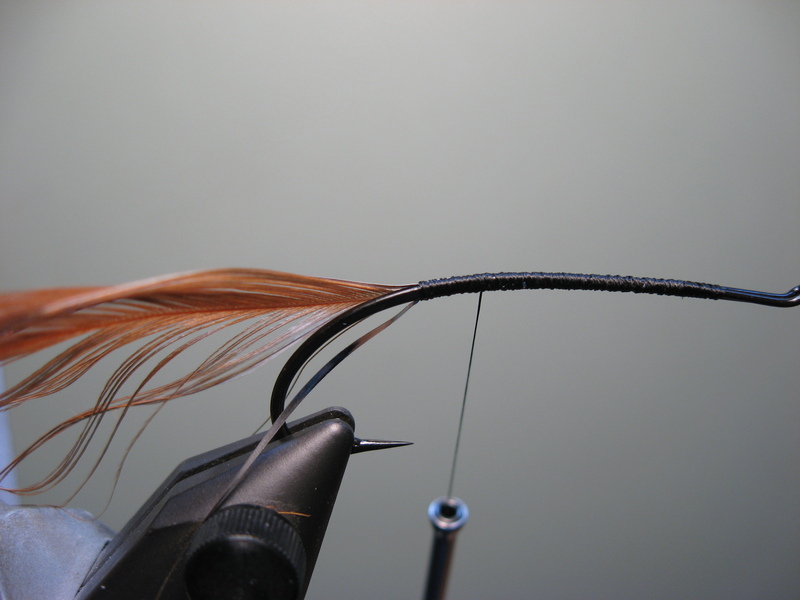 The “red” schlappen hackle is attached (brown by today’s nomenclature), silver tinsel on the near side, and gold tinsel on the far side. This will ensure a staggered appearance of the materials so that the tinsels will be spaced apart and the hackle will fall in between. We are now ready to dub the body. The body has been dubbed with our wool blend, the tinsels have been wound forward, and the hackle has been wrapped to fall between the tinsel ribs. 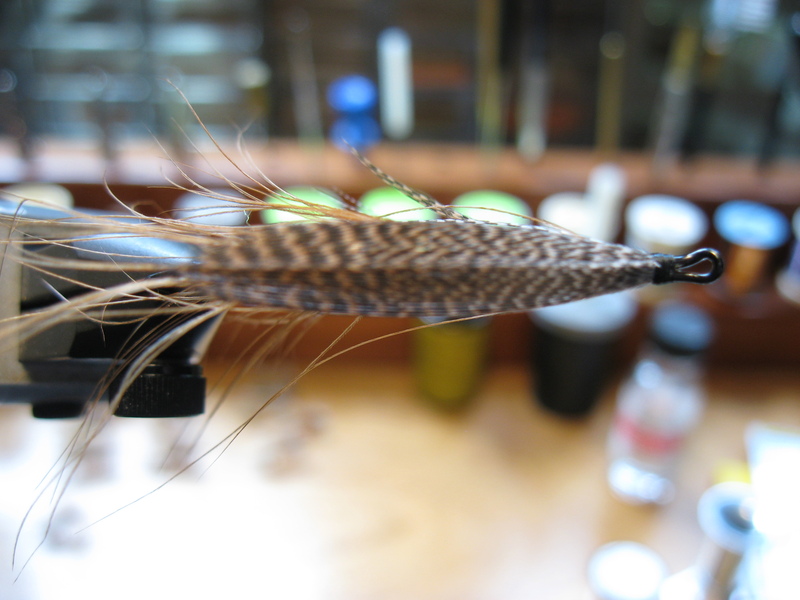 Now I apply the teal hackle for the throat and then the wing . Two slips of bronze mallard have been applied. On this fly, I applied the slips one at a time. First, the far side, then the near side using the far side as a brace. This is the top view of the completed wing. 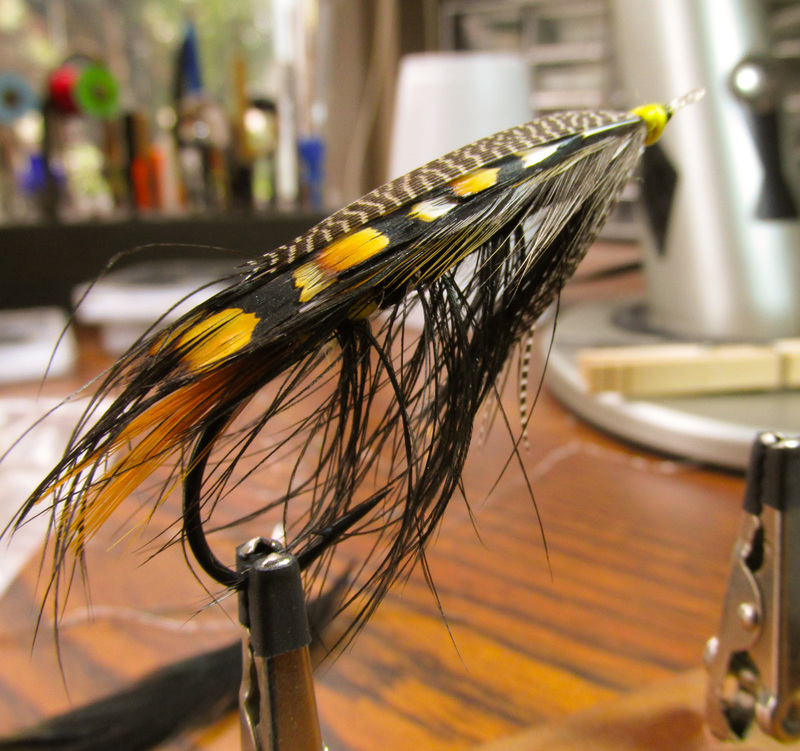 Here is the completed fly. A classic pattern by any standards. 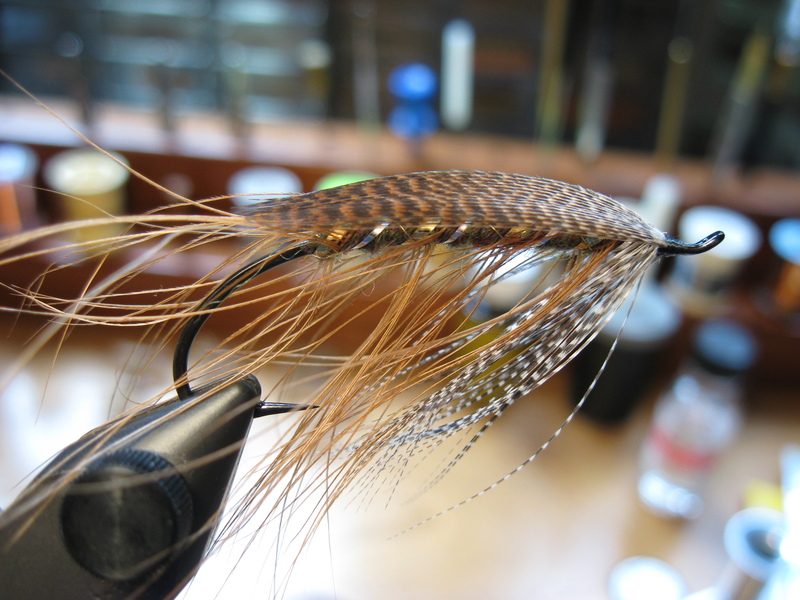 A subtle, somber little Spey fly, circa 19th century. Great step by step, just wondering how you blended the wool, coffee grinder??? I recently got some skeins of berlin wool but have no way to blend them for dubbing, though i’ve heard coffee grinders work, but never seen the final product. A coffee grinder works well for many yarns and furs. Cutting your yarn into 1/4″ or so lengths seems to be about right. Much longer and it can be difficult for the material to mix and may even wrap around the blades stem. 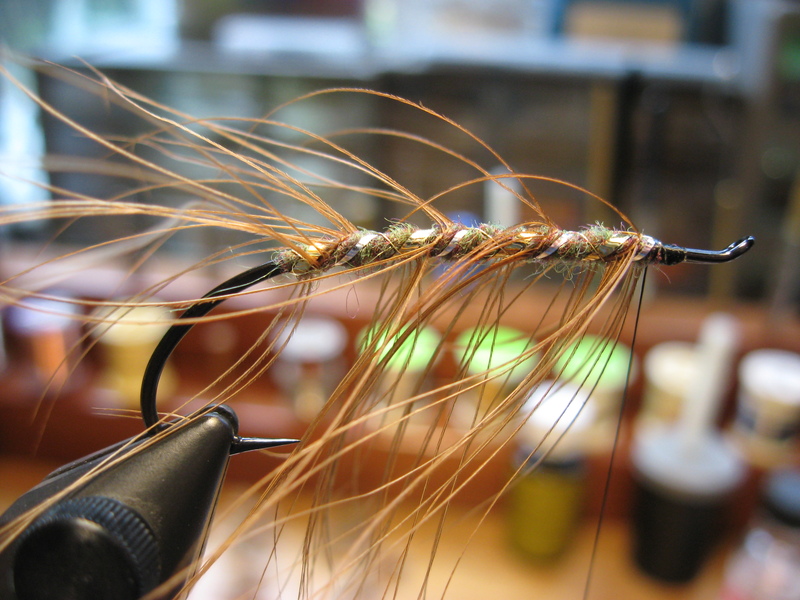 That said, I used a comb to whisk out some material of each of the colors and simply blended them by hand. It takes a little longer, but I can control the color easily. As long as I don’t need a large quantity, I like this method for wool. 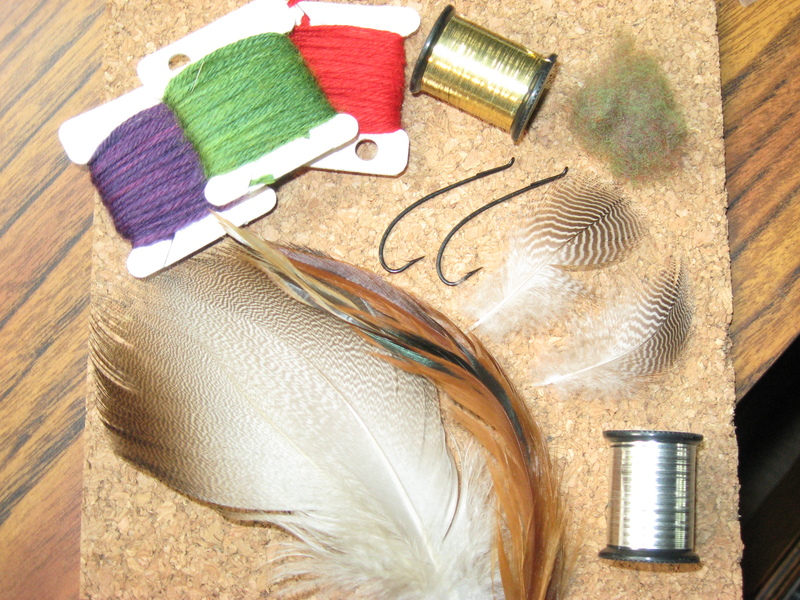 The grinder works great for synthetic yarns and for mixing yarns with fur. You can create a variety of blended colors in a hurry. You might give it a try!